Hey friends, it’s been a while. 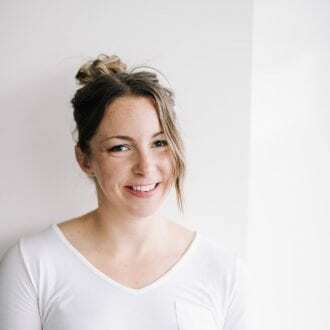 For those of you that don’t follow me on social media, I spent the last 4 weeks travelling around Vietnam and Cambodia so I’ve been a bit absent here at the blog. 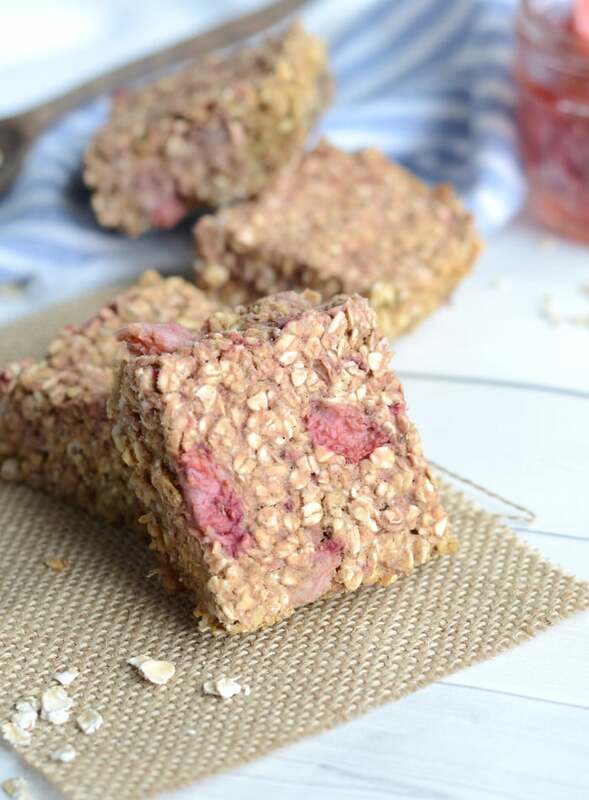 Today, I’m back at ya with these baked strawberry oatmeal protein bars! Due to my recent travels, my diet has been all over the place and my workout schedule kinda went out the window but for the first time ever, I decided to be totally okay with that. I decided not to worry, I decided to eat whatever I felt like and not feel any negative pressure over relaxing my workout schedule. I still exercised. I walked. I walked a lot. Like a lot, a lot. I went for runs on the beach, I did push-ups and squats in hotel rooms and some core work when I felt like it. I worked out in a gym a total of 3 times in 4 weeks. 3 TIMES! Unheard of. I didn’t lift weights but I moved my body. I relaxed. I read. I wrote. I ate and ate some more. I woke up each day with no real plans other than to live in the moment. I let go of any worry about the fitness I might lose or the weight I might gain. Nope. Didn’t matter. For once, I decided 4 weeks of travel through two incredible countries was going to be more important than stressing over locating a gym in Battambang, Cambodia. As amazing as my travels were, I came home craving tough, sweaty workouts and healthy, veggie-packed meals. I’m so fortunate I have a lifetime of healthy habits to fall back on. My first day back home, I made a meal plan, got groceries and I right got back in the kitchen. I’m craving normalcy in my diet and fresh green vegetables like you wouldn’t believe. I did some food prep today to get ready for the return to routine tomorrow. 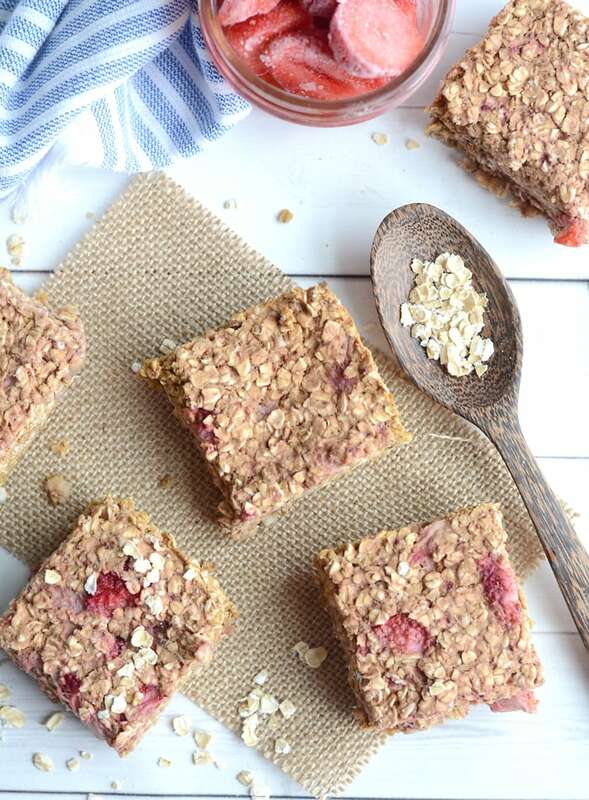 I made these baked strawberry oatmeal protein bars, slow cooker lentils, tandoori cauliflower rice, baked a spaghetti squash and prepped some overnight oats for the rest of the week. I’m carb-lover through and through and after eating all the bread, crackers, potatoes, rice, noodles, chips, cookies and fruit I could handle over the last 4 weeks, it’s time to wean myself back to a suitable, balanced number of daily carbohydrates instead of the carb free-for-all I’ve been enjoying for the last 4 weeks. 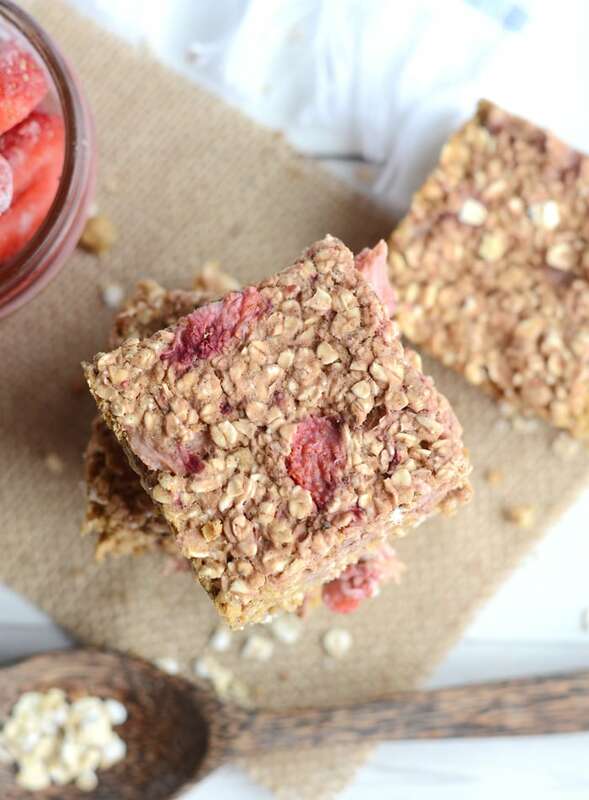 These baked strawberry oatmeal protein bars will help me ease back into carb-reality. 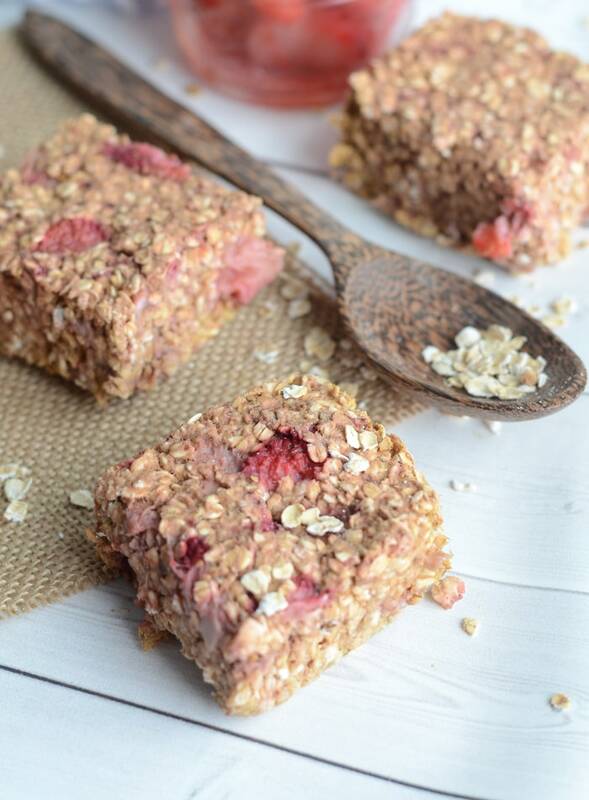 All you need to make these simple but tasty bars are frozen strawberries, oats and vegan protein powder. 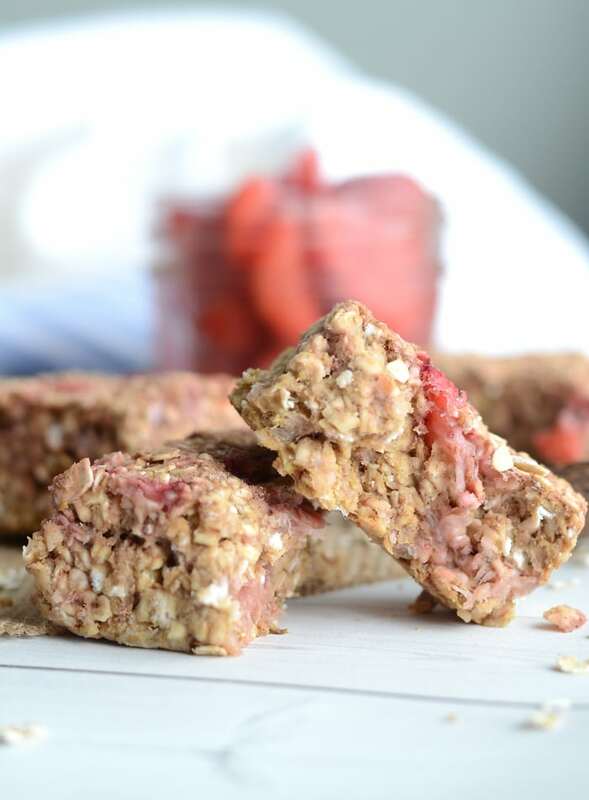 I was thinking about basic banana oat cookies and how I wanted to try them with strawberries in place of banana. It was a success indeed and I promptly ate 3 of them just to be sure. Carb withdrawal is real. I’m gonna get it under control, I swear. I went back to the gym today. It didn’t feel to bad. Lifting actually left pretty strong but bodyweight movements felt tough. I gained some weight while I was away. That’s okay. Life is short and I’m ready to dive right back into it, training hard because I love it. Never because I have to but always because I want to. A month might have been a bit long to let training slide but why worry. In a year, that month isn’t going to matter. If anything, my body is completely (COMPLETELY) rested and it probably enjoyed the break from years of heavy weightlifting. I’ve never, ever gone that long without lifting weights. It was strange. But once I let go of the pressure and worry, it was actually kinda nice not to rush off to the gym everyday at 5 am. And now…time for bed…I gotta rush off to the gym at 5 am tomorrow. 😉 can’t wait. These are not super sweet or decadent bars. They’re low in fat, sugar-free, oil-free and vegan and you only need 3 ingredients to make them. I like them for a pre-workout snack or sweet afternoon treat. I’m tracking macros again so you can expect more recipes like this on the way! Simple, easy and macro-friendly! I added some stevia to mine to make them a tad sweeter but that’s up to you. I used Vega Performance Protein to make these, which is a pea protein-based powder. Any vegan pea protein powder should work well. I haven’t tested these with other types of vegan protein such as hemp, brown rice or other whole food blends. Let cool completely before cutting into 8 bars and removing from the pan. This is not a very sweet or decadent oat bar. It’s healthy, simple, low-sugar and functional as a quick snack. I’d recommend adding some stevia drops or powder if you prefer a sweeter bar. How could you substitute protein powder in this recipe? Chia seeds perhaps? Can I add more scoops of whey protein? You’d have to adjust the other ingredients if you add more protein, I’m sorry I can’t way the exact amounts needed as I’ve never tried it with more protein. I’ve also only made these with vegan protein so I’m not sure if using whey would need any further adjustments. Let me know if you try it!